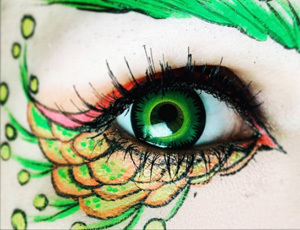 Buy now a pair of brightly green contact lenses perfect for costume parties. ColourVue Crazy Green Werewolf contacts come in a pack of two lenses available in powers. Inspired by werewolf legends, ColourVue Crazy Green Werewolf contact lenses come in bright green color and a range of corrective powers. These crazy costume contacts will become useful not only during Halloween but also any other costume event, such as cosplay, various cons and zombie walks. Thanks to their exceptional comfort and vision correction, they can be successfully worn by pretty much everybody for the whole day, without any problems. Try them out now!